I think of you as we embark on the Summer of 2018. May it be a time of relaxation and renewal … reconnecting with those you hold dear. And, of course, wonderful wines and foods! Below is a reminder about the October Europe Cruise plus a recipe meant to honor “dad” on Father’s Day. 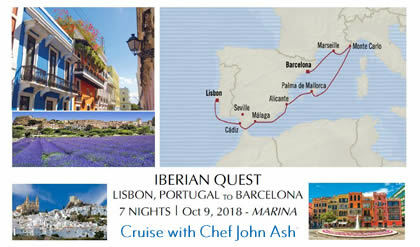 I’m doing a cruise October 9 – 16, 2018 on Oceania Cruises working its way around the Mediterranean from Lisbon and ending up in Barcelona. Oceania is a wonderful cruise line with smaller ships and a cooking school with hands-on cooking stations which we’ll of course take advantage of. Hope you can join us. For more information call Travelwize at 707-935-9493. PDF FLYER HERE. So here’s a redcipe that should make you Dad very happy. Not too difficult to do. I’m topping each steak with a nice cut of Cambozola cheese. Widely available, Cambozola is a triple cream, brie-style blue cheese made from cow’s milk in the German region of Allgäu. The cheese is injected with same blue Penicillium roqueforti mold used to make Gorgonzola, Roquefort, and Stilton. However, it is neither pungent like Stilton, nor crumbly like Roquefort. Alongside is a ramekin of creamed spinach. It was probably Peter Luger who originated the idea of creamed spinach when he opened his steak house in New York City in 1887. It’s hard to imagine today a steak house that doesn’t offer creamed spinach. Bring 1 inch of water to a boil in a large saucepan. Add the spinach, cover and steam until wilted, about 3 minutes. Drain into a colander, rinse with cold water and squeeze out as much water as you can. Transfer to a cutting board and chop relatively finely. Melt the butter in a medium saucepan over moderate heat. Add the onion and garlic and saute until onions have softened. Stir in the flour to make a roux and cook for a minute or two to get rid of any rare flour taste. Whisk in the milk and cook until hot and thickened. Stir in the cheese and nutmeg. Stir in the spinach and season to your taste with salt and pepper. Transfer the creamed spinach to a buttered casserole dish and sprinkle with buttered bread crumbs. Refrigerate until 40 minutes before serving. Bake in a preheated oven for 30 minutes or until hot and bubbly. Season the steaks well on both sides with salt and pepper. In a heavy skillet heat the oil over high heat. Add the steaks, reduce the heat to medium high and cook the steaks until done to your liking. 135 degrees for medium rare is recommended. Top steaks with the Cambozola and set aside for a few minutes for juices in the meat to redistribute and cheese to melt. 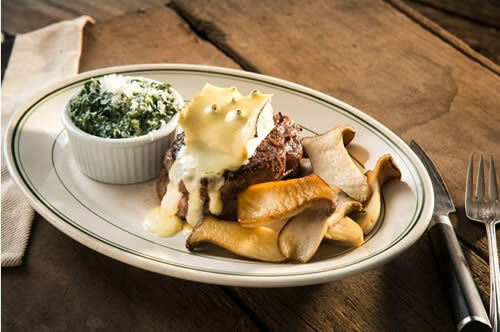 Serve the steaks with the creamed spinach and sauteed mushrooms.